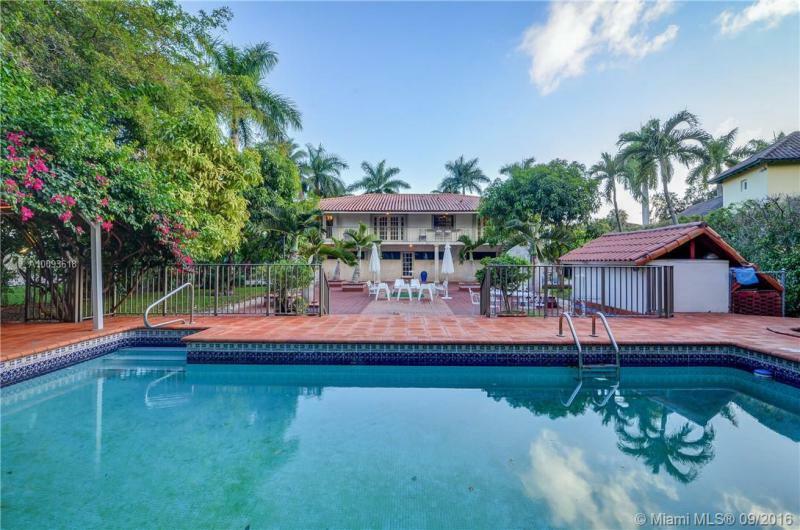 A MAGNIFICENT HOME ON THE ATHLETIC CIRCLE IN AVENTURA. THIS SPACIOUS TWO STORY HOME FEATURES 6 BEDROOMS, 5.5 BATHROOMS, 24HR GUARD AND GATED COMMUNITY, AN IMPRESSIVE MODERN KITCHEN, EXPANSIVE DINING ROOM, HEATED SALTWATER POOL, JACUZZI, LED LIGHTING, MARBLE FLOORS, PRIVATE COURTYARD, SEPARATE IN-LAW QUARTERS, AND MANY SOPHISTICATED FINISHINGS. THIS VIBRANT HOME ALSO OFFERS SPECTACULAR SUNLIGHT, GRAND LIVING AREAS, AND AN OPEN FLOOR PLAN PERFECT FOR ENTERTAINING. WALKING DISTANCE TO HOUSE OF WORSHIP. Huge Royal Palms welcome you to this home in secluded area of Cocoplum on a fabulous and quiet cul de sac. Bright living room, family room and master bedroom open up to a beautiful private pool, garden and very large patio ready to entertain. The kitchen opens up to the family room. 5 bed/3 bed upstairs, guest bed + office and bath downstairs. Gym and media room ground level. Best price in Cocoplum. Magnificent 6 bed / 5 bath home in prestigious gated community of Eastern Shores - only houses on the water - this beautiful 2-story home features extra high ceiling, very open feeling, nice water view, marble floors, large Italian gourmet kitchen with top of the line appliances, large master suite with breathtaking water view and balcony, tropical patio with heated waterfront pool - house built in 1994, Great opportunity, Buy on the Water for the price of a non waterfront! Under-construction designed by Renowned Architect ZW Jarosz, this sleek 2 story open plan house is strongly built in concrete and lots of high quality windows and doors. Double height living area with exposed staircase, Italian full height kitchen with great sub-zero/wolf appliances. 21??? high windows and sliding doors overlooking terrace, backyard, gazebo and pool area. Indoor patio overlooked by the kitchen and main entrance. Smart home. 3 Bed each with balconies and 4 bath + a playroom and den/office. Impeccable, turnkey two story house in a secluded, yet centrally located mid-beach enclave. Bring your most discerning buyers. Professionally renovated and styled, this property features dark wood and marble floors throughout. Refined furnishings, along with attention to luxurious details, a beautiful vaulted ceiling, top of the line appliances, a separate bar room and custom made cabinetry are some of the features that make this home a great purchase for a buyer who enjoys comfortable, fine living. Beautiful 5 bed, den and 3.5 bath residence in exclusive Oak Hammock Estates. Perfect for large families, boasting 4600+ SqFt of living area and featuring grand ceilings, open style concept, surround sound through out, brand new stainless steel appliances and high quality carpets. Step outside to a backyard oasis, large pool and spa perfect for entertaining family & friends. Hurricane shutters throughout. Community amenities; park, playground, full size basketball & tennis courts, 24/7 secured gate.